Air Wisconsin operates our fleet of Canadair Regional Jets exclusively as United Express. We are looking for dedicated team members at all of our Maintenance Bases. We are excited to offer up to $4,500 in sign-on and experience bonuses for our front-line maintenance positions such as A&P Mechanics, Avionics Technicians, Crew Chiefs, and Inspectors at all of our bases with an additional $10,000 bonus in Milwaukee and Dayton. We are also offering bonuses up to $15,000 for new hire Maintenance Controllers. If your desire is to contribute your mechanical skills to the success of a superior maintenance team instead of being “just a number” among a thousand mechanics, Air Wisconsin is where you will find career satisfaction. Air Wisconsin Mechanics and Avionics Technicians are encouraged to use all of their knowledge and skills learned during training or prior experience to troubleshoot, inspect, test, replace, dismantle, alter, fabricate and repair the airframe components, engines and the various pneumatic, hydraulic and electrical systems installed on the CRJ fleet. A variety of tools and equipment are used, including precision measuring equipment, pneumatic devices, electrical testing devices, general shop equipment, ground support equipment and computers. Perform maintenance on CRJ 200 series and other equipment. Perform all assigned work in accordance with manufacturer’s aircraft maintenance manuals, Air Wisconsin General Maintenance Manual and FAA Regulations. Effectively troubleshoot and repair all aircraft systems. Must be able to perform all line maintenance functions unsupervised, at any time. Complete aircraft maintenance documentation as required. All training is paid for by Air Wisconsin. Wages for A&P Mechanics and Avionics Technicians are set by the collective bargaining agreement between Air Wisconsin Airlines and the International Association of Machinists and Aerospace Workers (IAMAW). Technical Stores/Supply team members are an important asset within Maintenance at Air Wisconsin. 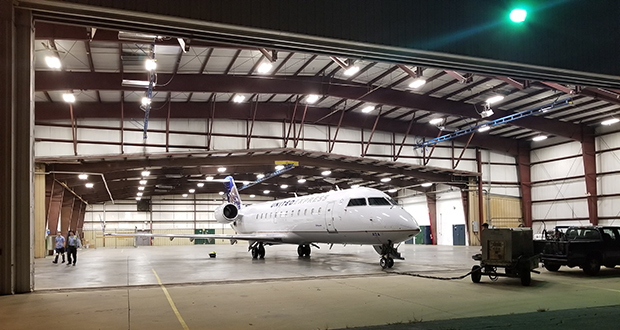 Tech Stores Clerks are responsible for receiving, shipping, storing, distributing and monitoring aircraft parts, materials, supplies and tools/equipment used by Maintenance employees to maintain our Bombardier CRJ aircraft. Locate and retrieve aircraft parts, tooling and supplies for the Maintenance Department. Perform accurate and timely computer transactions, including parts issues, stock returns, and station and bin transfers. Deliver parts and/or company materials to designated locations. Receive inventory and perform associated computer transactions. Perform shipping functions, including Dangerous Goods. Maintain a clean and organized stock room in compliance with the General Maintenance Manual and federal regulations. To ensure success, all Tech Stores Clerks are required to attend Initial Maintenance Training during the first week of employment, followed by job-specific training. All training is paid. Wages for Tech Stores Clerks are set by the collective bargaining agreement between Air Wisconsin Airlines and the International Association of Machinists and Aerospace Workers (IAMAW). Aircraft Cleaners are an integral part of the maintenance organization. They are responsible for cleaning and grooming the interior and exterior of aircraft, providing our passengers with an unparalleled customer experience. Aircraft cleaners may also be tasked with cleaning aircraft components and physical plant facilities, including general janitorial duties. Deep cleaning of aircraft (sanitizing, vacuuming, washing) interiors, including flight deck, galley, passenger compartment and lavatories. Restocking required passenger and flight crew supplies such as inflight magazines, lavatory supplies and flight attendant supplies. Dry wash and polish aircraft exterior. Hangar facility organization and cleanliness. Wages for Cleaners are set by the collective bargaining agreement between Air Wisconsin Airlines and the International Association of Machinists and Aerospace Workers (IAMAW). Starting salary: $10.75/hour for all locations. Additional shift premiums and overtime may also apply. Air Wisconsin Maintenance Controllers serve as the central coordination point for the airline’s technical operations. Maintenance Controllers utilize their knowledge of aircraft systems, mechanical experience, and good judgement to ensure safe and airworthy aircraft are made available to the flight operation in the most efficient manner possible. They also serve as the primary point of contact within the company for matters related to aircraft servicing. Maintenance Control is a Salaried Non-Union position. Compensation is determined by experience and abilities.